Boundary Survey is basically carried out to determine the length, direction of land lines and to establish the position of these lines on the ground that has been described either graphically (Plat) or in writing (Deed). We know the types of property disputes, will discuss with client and study the data such as tippan RTC village map and ground dimension to determine exact boundary and establish at land confirm to the client. To mark the precise boundary of any project on ground. 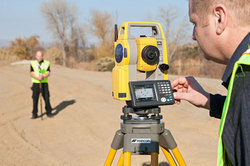 • Topographic survey involves determining the horizontal and vertical locations of objects on the surface of the earth. Horizontal location entails locating 'objects' like roads, railways, ponds, houses, boundaries of properties, etc. by measuring horizontal distances; the objects are indicated by symbols.